Type current Safari URL - This will type the URL of the frontmost Safari tab/window into your current application. Handy if you're chatting with someone and want to paste them a hilarious YouTube URL without switching apps, copying the URL to the clipboard and switching back. - It does not use the clipboard, it actually types the URL into the current application, so any modifier keys you hold will change what is being typed. I've configured the macro to fire when the specified hotkey is released, to minimise the chances of this happening. Toggle Caffeine - Very simple, just toggles the state of Caffeine with a hotkey. This is pretty simple really - unless Apple wants to launch a new Mac Pro and have it be out of date almost immediately, they need to wait until Intel has released Ivy Bridge Xeons, which won't be until next month at the earliest (and given the delays with Haswell, July seems unlikely). Also coming later this year on Intel's roadmap is the introduction of Thunderbolt 2. Both of these things would seem like an excellent foundation for a new line of professional Macs. Given the very short list of hardware model numbers that leaked ahead of today's WWDC keynote, my guess is that Apple is going to hold a pro focused event in 2-4 months and refresh MacBook Pros, Mac Pros and hopefully the surrounding halo like Thunderbolt displays (which are crying out for the new iMac style case, the newer non-glossy screen, USB3.0 and soon, Thunderbolt 2) and the pro software Apple sells. Having a pro-only event would also help calm the worries that Apple has stopped caring about high-value-low-volume professional users. (While I'm throwing around random predictions, I might as well shoot for a name for the radical modularity model. I would stick with the Lightning/Thunderbolt IO names and call it Super Cell) Edit: I'd like to credit Thomas Hurst for helping to shape some of my thinking about QPI. My attempt at iPad repair. With these options all configured, all you have to do is hit the hotkey, select the old clipboard item you want and hit Enter. It will then be pasted into the active window. This is also useful to preview the current contents of the clipboard before pasting (which is always a good idea if you're pasting into a sensitive terminal or a work IRC channel and want to avoid spamming some random/harmful nonsense in). My sincere thanks to everyone who helped out with making this release happen. However, I do think that the Terminator project is running out of steam. Our release cadence has slowed dramatically and I think we should acknowledge that. It's entirely my fault, but it affects all of the userbase. I am planning on driving Terminator to the 1.0 release, but the inevitable question is what should happen with the project after that. The fact is that, like the original projects that inspired Terminator (gnome-multi-term, quadkonsole, etc. ), technology is moving under our feet and we need to keep up or we will be obsolete and unable to run on modern open source desktops. There is a very large amount of work required to port Terminator to using both Gtk3 and the GObject Introspection APIs that have replaced PyGtk. Neither of these porting efforts can be done in isolation and to make matters more complicated, this also necessitates porting to Python 3. I am not sure that I can commit to that level of effort in a project that has, for my personal needs, been complete for about 5 years already. With that in mind, if you think you are interested in the challenge, and up to the task of taking over the project, please talk to me (email cmsj@tenshu.net or talk to Ng in #terminator on Freenode). My suggestion would be that a direct, feature-complete port to Python3/Gtk3/GObject would immediately bump the version number to 2.0 and then get back to thinking about features, bug fixes and improving what we already have. Alleyoop - updates installed plugins (if the workflow author supports it, which many currently do not). I hope this will be a temporary workaround until a centralised workflow repository is created. Battery - shows all the vital stats of your MacBook's battery without having to run an app or a Terminal command. Built-in Sharing - lets you share files directly to all the social services that OS X supports. TerminalFinder - lets you quickly get a Terminal for the Finder window you're looking at. I imagine there will be more to come, the total number of workflows is exploding at the moment! Google Search - get live results from Google as you type. It's not always what I want when I'm searching, but it's a very quick way to get some insight into the results available. Open SSH - This collects up all your hosts from SSH's known_host file, config file and local network, then opens terminal windows for you to ssh to the host you choose. Parallels Desktop - Easy way to start/resume your Parallels virtual machines. Rate iTunes Track - does what it sounds like, rate the current iTunes track. VPN Toggle - get on/off your corporate network quickly. Lots more on the Alfred 2 forums. At some point it would be nice to see this unified into some kind of integrated search/download feature of Alfred 2. Update: (2012-04-12) I've written a second post that covers a few more workflows I've discovered since this one. 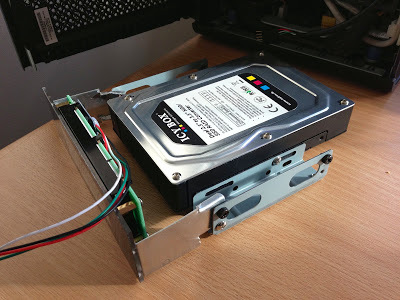 Rather than just waste the 5.25" bay behind the LCD, I wanted to try and put some storage in there, particularly since the Microserver's BIOS can be modified to enable full AHCI on the 5th SATA port. 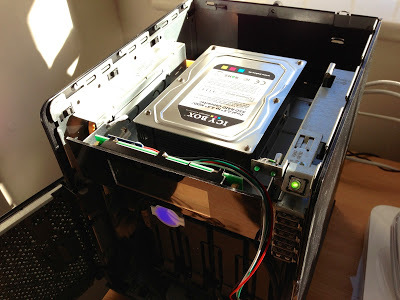 I recently came across the Icy Box IB-RD2121StS, a hilarious piece of hardware. 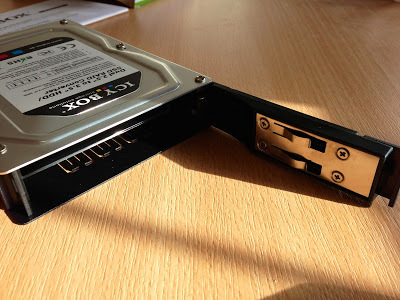 It's the size and shape of a normal 3.5" SATA disk, but the back opens up to take two 2.5" SATA disks. 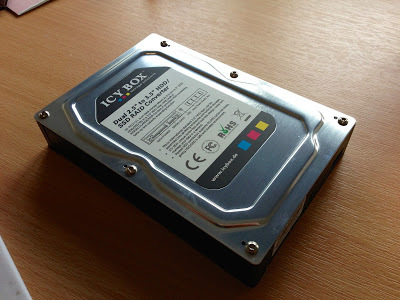 These disks can then be exposed either individually, or as a combined RAID volume (levels 0 or 1). Since I happen to have a couple of 1TB 2.5" disks going spare, this seemed like the perfect option, as well as being so crazy that I couldn't not buy it! 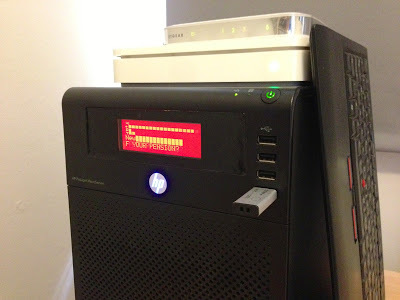 The LCD is a red-on-black pre-made 5.25" bay insert from LCDModKit. It has an LCD2USB controller, which means it's very well supported by projects like lcd4linux and lcdproc. 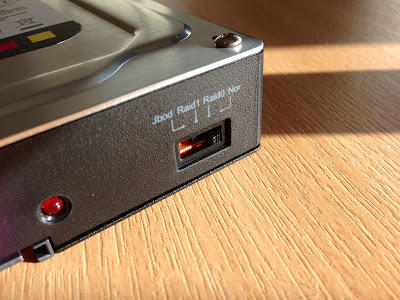 It comes with an internal USB connector (intended to connect directly to a motherboard LCD port), except the Microserver's internal USB port is a regular external Type A port. Fortunately converters are easy to come by. Something I hadn't properly accounted for in my earlier simulator work is that the real hardware only has space for 8 user-definable characters and I was using way more than that (three of my own custom icons, but lcd4linux's split bars and hollow graphs use custom characters too). Rather than curtail my own custom icons, I chose to stop using hollow graphs, which seems to have worked.